KIEV, Ukraine -- Russia’s occupation of Crimea has reached its third anniversary, and there is no evidence in sight that President Vladimir Putin will withdraw his occupation forces. 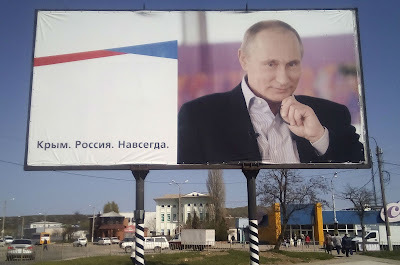 A billboard with a portrait of Russian President Vladimir Putin is displayed on a street in Kerch, Crimea, April 7, 2016. The board reads: "Crimea. Russia. Forever." Both the United States and Canada have reiterated their support for continued sanctions against Russia as long as Crimea continues to be occupied. Still, ending Russia’s illegal occupation could take decades. To increase the effectiveness of Western pressure on Russia, three additional policies are necessary. First, Ukraine must stop expecting the West to assume the heavy lifting of sanctions against Russia while Ukraine itself continues to trade with Crimea and the two Russian proxy enclaves, the so-called Donetsk and Luhansk People’s Republics (DNR and LNR). Ukrainian leaders have no moral leg to stand on when they call on Washington, DC, and Brussels to continue the sanctions regime while Ukraine benefits from trade with Crimea and the DNR and LNR. In fact, Ukraine’s policy of supporting Western sanctions while reaping profits from trade with the occupied regions was dashed only by Ukrainian and Crimean Tatar activists, not by government policies. It is time for the United States to demand that Ukrainian leaders get real about sanctions. Activist-initiated blockades only serve to increase tensions and political instability, and could threaten Ukraine with a third Maidan—none of which are in the US’ interests. Second, Western diplomats and policymakers should advise members of Russia’s opposition that they cannot be expected to be viewed as democrats if they continue to support Putin’s illegal annexation of Crimea, or back Putin’s claim that Ukrainians are not a separate people from Russians. Western democracy-promoting foundations that receive funding from the US government such as the National Endowment for Democracy should threaten to withdraw their support for those members of Russia’s opposition who endorse Russia’s chauvinist and imperialist actions. Until now, the majority of Russia’s opposition groups have supported Putin’s land grab in Crimea. “A Russian democrat ceases to be a democrat when he talks about Ukraine,” former Ukrainian President Leonid Kuchma presciently wrote in his book, Ukraine Is Not Russia. Indeed, of Russia’s fractured opposition, only Boris Nemtsov—who was assassinated in February 2015—and the very marginal Yabloko party have not held chauvinistic views of Ukrainians and opposed Putin’s occupation of Crimea. Alexei Navalny, who was behind the massive March 26 protests—Russia’s biggest in five years—is typical of Russia’s opposition; members tend to be more nationalistic than democratic. Like Putin, Navalny believes that Ukrainians are not a separate people; he supports the integration of Russia and Ukraine, and opposes sending weapons to Ukraine. Third, the EU needs to get its act together. Until now, the EU has supported sanctions with one hand while simultaneously serving as a "global laundromat" and accepting billions of dollars of dirty money from Russia with the other. A new report by the Organized Crime and Corruption Reporting Project found that Putin’s Russia laundered $20-80 billion between January 2011 and October 2014. According to Anders Åslund, an expert on Russian economic policy, Russia and Ukraine have exported over $700 and $100 billion, respectively, to the EU and offshore tax havens since 1991. Accepting dirty money from Russia encourages corruption by providing outlets for stolen funds. These can be used for subversion, information warfare, corrupting European politicians, undermining trust in banks, and purchasing real estate. In truth, Putin’s biggest export to the West is not oil and gas, but corruption. In the West, political consultants, lobbyists, lawyers, tax advisers, private schools, and journalists have all been corrupted by their acceptance of such funds. Accepting dirty money deepens the cynical belief among Russian leaders that everybody has a price: it is just a question of negotiation. This, in turn, undermines the West’s moral stance on the benefits of good governance and the rationale behind the EU’s sanctions policy. US policymakers should advise Ukrainian leaders, Russia’s opposition, and the EU to end their contradictory policies, which have permitted Russia to erode and evade the sanctions regime.